Heating Emergency? Let Us Sprint To Your Rescue. No heat? Low heat? Heating system leaks? When you have an issue with your heating system, you need a company who can act swiftly to restore your comfort. T.Webber has been providing same day emergency heating services throughout the Hudson Valley since 1989. Our team of Heating Experts have the tools, knowledge & experience to diagnose and resolve your problems quickly and with care. We understand that heating system failures not only cause discomfort, but can also threaten your home. Without heat, pipes are susceptible to freezing which can cause extensive and costly damage. Fast response and reliable repairs are necessary to ensure your home and family are safe and comfortable. From routine to emergency repairs, all T.Webber service calls begin with a thorough diagnostic of your home’s heating system. Once any issues are identified, our Heating Experts will explain the source of your problem and make recommendations for solutions. It is always our goal to educate customers about their home’s systems to empower them to make the best decision for their family and budget. With approval, most repairs can be completed same day – allowing you to get your life back to normal as quickly as possible. 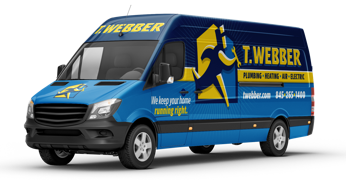 Why Call T.Webber for Your Heating Emergency? Fast Response Time – our staff is available all day, every day for your convenience. Evening, weekend or holiday? You’ll always get a live, friendly employee to assist. Same Day Service, Repair & Installations – Our staff arrives with a fully stocked “warehouse on wheels” allowing us to complete most all jobs same day. Thorough Professional Heating System Diagnostics – Lasting repairs are dependent on correct diagnostics. Our team undergoes regular training to hone their craft and ensure they can properly address each and every concern. We also take the time to evaluate your entire system to understand any contributing factors. Expert, Technical Repairs – Our technicians are not only expert craftsmen, but also perfectionists who take pride in their work. All repairs are made to technical code or better, with the highest quality material. Commitment to Excellence – A+ rated by the BBB, T.Webber is committed to raising the bar in the service industry. From courtesy calls before arrival, wearing booties to protect your home, and always cleaning up after ourselves. We stand behind all of our work and serve our community with honesty and integrity. Have a heating emergency in your Hudson Valley home? Don’t delay and call T.Webber for prompt, professional emergency services.